Nintendo recently published its latest six month financial results briefing and it makes for quite interesting reading. One thing that stood out to us was the slide revealing the gameplay trends across Japan, the US and Europe in regards to how people actually use the Switch. 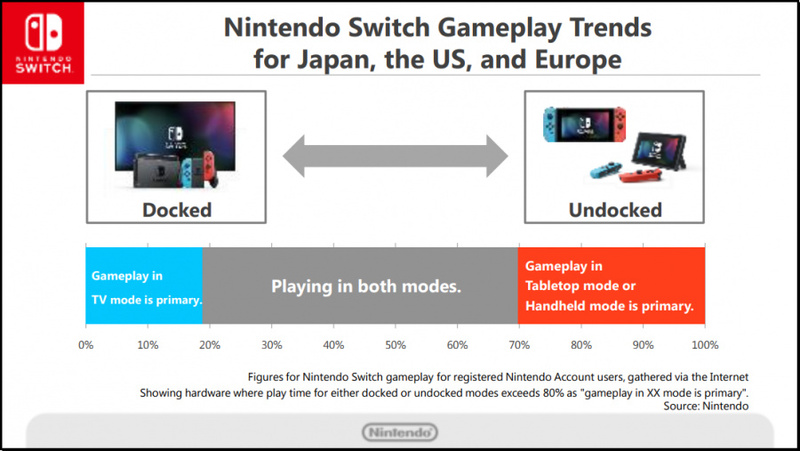 Predictably a large number of consumers use the Switch in both handheld mode and docked to a TV, however around 30% of users appear to mostly use the Switch in handheld mode. On the other hand slightly less than 20% of users play the Switch in docked mode for the majority of their gameplay time. We wonder what the split is like between Japanese gamers and the West. Nonetheless it is quite interesting data and no doubt Nintendo will be thinking about this quite carefully when coming up with revised Switch hardware in the future. Would a bundle without a dock, for instance, be attractive to cost-conscious consumers? How do you most like to play your Switch? Let us know with a comment below. I play a bit of Splatoon docked here and there, as well as local multiplayer games of course, but a large majority of my gaming is spent in handheld mode. Even before the Switch came out though, I did most of my gaming on the 3DS. I just love handhelds. Misleading headline. Nintendo gamers clearly prefer using it as a hybrid device. I find handheld mode convenient, but always opt for TV mode if it's available. I'd guess if anything it's way more down to people's lifestyle - it's kinda expected given how hectic people's schedules are and the rise of mobile gaming etc. I'm happy for the Switch to act as both, and it's great that it does. But playing something like Zelda or Mario feels like they are at their best on the big screen. I tend to focus more on side-quests or grinding on handheld sessions. @Ralizah True, the big majority of people are using it as a hybrid console. I'd say 90% of the time it's been in handheld,mainly because the Mrs or kids hog the TV. It depends on the game mostly. If it‘s a game of a scale like Mario Odyssey or BotW, I mostly play it docked. Games best enjoyed with the Pro Controller like Splatoon are also played on tv. Games like Mario x Rabbids or most Nindies, I like to play in handheld, coiled up in a blanket, laying on the bed. I only use handheld when I have to. Sort of takes away some of the epicness, being able to share moments and being able to play multiplayer when you're hunched over the system in handheld mode. @Ralizah This! I mean, obviously most people who buy a Switch are going to use the handheld mode to some extent, it's a big sell of the console. 50% hybrid is more than 30% handheld. Results actually say that 70% of people use it in docked mode some or all of the time. @timson72 That's a pretty big reason why I use handheld from time to time if it is a single player game. Even with those though, my wife and our little girl enjoy watching Zelda and now Mario at times. Definitely handy to have handheld as an option though with a family. I actually play it docked most of the time. But that's only because I prefer taking my 3DS on the go because it's smaller. I'll take the handheld mode Switch with me on longer trips and it's great that way, and I'll bring the handheld mode Switch into the bedroom/bathroom, etc, but if I'm at home, I really prefer it to be docked. I use mine in a bit of both but mostly docked. The ease of use between choosing the best option that suits me at the time is what I love the most though. Now instead of pausing a game or completely turning it off I can grab it and keep on gaming. Great time to be a gamer. When I get my Switch - it's a promise! - I'll do what the console is born to do: to get the best of both worlds (if you can forgive the unintended Hannah Montana shout-out). That graphic really tells us very little. 20% of people use it docked 80% of the time? The raw data would be much more interesting, but I guess we'll never see that. I've owned my Switch from day one and I have yet to take the dock out of the box. Handheld and docked in the house. Handheld and table top on long trips away. As others have said the type of game is important, two player generally better on the TV. Stuff like Sonic Mania and the Neo Geo stuff handheld all the way. This chart shows how right Nintendo were to give people options. That said a £199 handheld only deal might come in the future. Or perhaps a build your own bundle deal: Left colour, right colour, base unit. Then: pro controller, case, dock & game maybe? Since I need to study a lot, I can't play docked as much as I want to. But for undocked, it is just so convenient to take it with you. And since I travel a lot too, I probably use undocked more than docked. I prefer to play docked though, since it gives a better experience in my opinion. Just for the record, I used to get about 10~15 hits on Streetpass on my 3DS per day on the train here in Japan. Ever since the Switch was released, it's dropped to about 2~3, if that. However, I've still only seen a Switch in the wild ONCE, and it wasn't on the train. That tells me that Japanese people, at least, prefer to play it docked. Or at least out of my sight. How rude. Switch Mini with no dock nor joycon at 199$ to launch with Pokémon, and that 25 millions prediction for the 2018 FY looks less insane to me. Posted this in the forums earlier. There's other data as well that say that 86% of Switch owners are male. I'm one of those, in the majority for once lol. Here's hoping the headline gets updated. I play Spla2n exclusively as docked, but Odyssey has been mainly handheld so far, because I’ve mostly played it while commuting. I’d probably have played Spla2n in handheld more if the offline single player was more enticing and could be easily played on the train. Surely the important stat here is that most Switch players use it as both a Home Console and a handheld, suggesting they've absolutely nailed the concept. The rather odd headline on this article is rather selling that success short. I have only taken my Switch out of my house once. I just bring my 2DS XL to play on the go. But what I like doing is sitting on my couch playing the Switch in handheld mode. The controllers feel better and I can see better. The only time I play docked is when playing a 2 player game or using motion controls (which I never do except in Odyssey). Mario Kart is easier in handheld mode, but for games like Zelda and Odyssey i go docked. The visuals are so much better on the big screen. @LeonBelmontX You can use statistics to prove anything. 105% of people know that. @electrolite77 that is another way of viewing the data sure! Also interesting to note that the majority of buyers are in their 20s and 30s. It fits into adult lifestyles. TV Mode when I'm home (except when I need a bathroom break and I can't get myself to leave a game). Handheld/tabletop when I'm travelling or at work during lunchbreak. Regardless of how people use it, Nintendo is 100% making billions! "Handheld mode? What's this handheld mode?" @gaga64 That's the opposite to me: I play Odyssey 90% docked and Splatoon2 on handheld mostly. I find it so impressive that an online shooter of the calibre runs on a handheld, and Odyssey definitely controls better with two detached joycons. @flatspikes You can build your own bundle exactly like you described already in Japan, on their MyNintendo site of all places. I was playing around with the various customisation options a few weeks back. You can even choose what straps you want included. Some real snazzy looks are possible.Hopefully something similar will come to the west as it's a great idea. @Ralizah Absolutely correct. The graphic speaks for itself and the headline is just wrong. I’ve probably used my Switch for at least 250 hours so far. About five hours have been on the TV in docked mode, with the remainder in handheld. Tabletop mode? Honestly no more than fifteen minutes. It really is 50 /50 for me. Just depends if I get to use the TV or not. Completely depends on the game. Zelda/Mario/Splatoon I prefer playing docked, while Mario Kart I prefer playing handheld. There must be an exponentially greater number of people in Japan who use the NS regularly as a portable, because it's extremely rare in the USA. Even in the nation's capital, you almost never see anyone with one- I've only seen one person since launch actually using an NS in public. There were a lot more people going around with a 3DS by this equivalent point in it's lifespan. I would attribute this to US culture combined with Nintendo's marketing. They're going ham on the whole "hybrid" moniker, while emphasizing it's the Wii U's replacement, and Americans tend to have more of an affinity for home devices than portable... (With the DS being an anomaly) So I would suspect that the vast majority of NS owners in the USA are hardly ever taking their console outside. It's like some mythical beast that I only ever hear of commonly being used that way on internet forums. As I rarely leave the house, docked/tv mode is for me. Use it just like the Wii u. Always docked. And how much of the handheld use is while sitting on the couch, near a TV? I would guess a lot... which means the WiiU could have been successful if it were properly marketed as a console with the ability to play games without the TV, instead of attempting to make clever use of the "second screen". That being said, the second screen was often incredibly useful while playing on the TV. Oh well... glad to see the Switch is successful and being fully supported with good software. I've been using the system exactly how Nintendo intended, well except for rooftop parties, E-sports events and next to basketball courts with the lads. I've even used it at airports in Bangkok and Copenhagen although unfortunately no hot blondes came to sit next to me. I would say I've used it 50% of the time in handheld mode, 40% docked and 10% in tabletop. It would be great if your system actually told you how you've used it. It must be built in to the system for Nintendo to have this data. Not sure why the age group data is not included here though as that's the most interesting data. It turns out 17% of Switch users are aged 35 to 44, so there's the same amount of us oldies playing as there are under 12 whipper snappers. That makes me happy.And they say Nintendo is just for the kids. I have only played my Switch in handheld mode so far, and I don't see that changing any time soon. I'd certainly play it on the big screen if I got the chance, but most of the time I simply don't get the opportunity. Interestingly my son will play it hand-held even thought he's got every opportunity to play on the big screen. I prefer the portable mode. 80% portable en 20% docked I think! I really enjoy that switching between modes goes so smooth! I never undock my Switch. I play more in docked mode. But only just. Just today I was playing Stardew Valley for about 2 hours in handheld mode. Then I took a break to eat dinner and came back to play Mario Odyssey for another hour and a half docked. I play in handheld all the time on the train and at a cafe in Kyoto. And I play docked at home after work most days. I'm very much in camp docked, considering the relatively uncomfortable handheld mode, and tabletop mode. My eyes can't deal with smaller scale screens, hence why I gave up mobile/tablet gaming altogether months ago. @The_Mysteron To be honest, I’d prefer to play Mario docked, and did so a little over the weekend, but we’re a 1 TV household, and I get last vote after the wife and kids... Truth is I just get more gaming time on the train than I do on the sofa. I only dock mine for multiplayer games like overcooked and jack box party, although I only get the rare chance for that. I'd say 95% it's a handheld. Love having the option though. Hybrid for the win! 95% handheld for me. But I play on TV when I have that 5% chance. @Ralizah Headline is still accurate. It is comparing portable to docked, and of those two choices, portable is clearly more popular. Also, it states "primary" method of play - I'd assume the vast majority of people use it both docked and portable at some point. I'm about 80% portable myself, but I still dock every now and then, especially for multiplayer games. So although I use it as a hybrid, my primary means of play is portable. So wait, you mean most people are using the most powerful portable console as a portable at least some of the time? Gasp! I have a 4 hours commute (there and back) three days a week so portable is perfect for that. Mostly docked at home though. Although my two oldest children and myself played tabletop in the summer outside which was great fun. I wasn't going to get a Switch and when I did it was an impulse purchase but I don't regret it for a second. I use both but mainly undocked. Docked 99% of the time for me. A mixture of both. It’s nice to lounge on the sofa stretched out, playing handheld and over to the tv for epic games. I’ve noticed I very rarely take it out the house though. The article’s title is quite misleading... isn’t it? Anyway, I use my Switch in both TV and handheld mode. If I’ve got the TV for myself, I play docked. If the TV is unavailable, I play in handheld mode. The Switch is convenience at its maximum expression. I love that. I prefer both but if I had to choose I pick handheld mode. I actually love playing the Switch as handheld. Wouldn't it be cheaper to make one for those customers that are docked only? You could ditch the screen. I prefer Both of Docked and Undocked. But mostly 99% will be Handheld, 1% Docked if i want to. What is the point to sell Console Mode Only ? I use it in docked mode most of the time, but occasionally it's fun to pick up as a handheld, especially if going away or something. I use my Switch in both modes all the time. Like, if I want to relax in my warmer bedroom and stay underneath the sheets, I'll do it that way. But if I'm up and about and am fine with spending my time in the much more spacious, room I have dedicated to gaming (which a big screen tv, mind you) then I'll totally play docked. Just depends on what I fee like. It essentially comes down to: do I feel lazy or not? I have to say, I was initially not too crazy about portable mode and I didn’t think I would use it all that much, but in practice, it works really well. I find myself taking my Switch to bed with me every night and playing for a bit while I fall asleep. It’s very useful that way for games that I don’t want to put down. Granted, I do spend most of my time playing it docked, but the versatility of the system is a phenomenal selling point. I wonder if there will be a successor to the 3DS now since Nintendo are moving more into smartphone apps. @Anti-Matter the article said specifically for Budget minded customers. That seemed like the cheapest to me. You're headline is completely wrong. That's not what the data shows at all. To answer your question though, about 90% docked and 10% handheld. is there a way to reduce the sensitivity of the joycon analogue sticks? I find I've far more control using the pro controller as it has larger thumb sticks. Can we stop arguing about whether it's a handheld or home console now? That was so dumb. Well mostly docked when I’m at home, or rarely in a hotel room when travelling. As of for portable, is when I’m mostly out of the house or when I can’t bring a dock. While I use both methods of play with the Switch (docked and handheld), I think I use it more in docked mode. Especially now that Super Mario Odyssey has released. That game just feels better in docked mode and it allows for motion controls to throw Cappy! And I really don't like to play Splatoon 2 in handheld mode, that game is docked all the way. But games like Stardew Valley, Pokken Tournament, and Sonic Mania, I tend to gravitate more to handheld with them. Mine is played mostly handheld. I am docked the vast majority of time. I'm a big fan of portable consoles so i played most of BotW in portable mode but i'm starting to like docked more and more. Every time i have the chance i play Mario Odissey in docked mode. I play Mario and Snipperclips docked. I play Kart and Splatoon mostly docked unless I'm playing local multiplayer in those two games, then it's tabletop mode. However, I like to play Sonic and Has Been Heroes in handheld mode. I use it both ways. Big 3d games I prefer to play docked and with the pro but 2d platforms I tend to use hand-held (the d-pad on the pro is absolutely terrible and not accurate at all and I don't find the grip comfortable). Also I carry my switch with me everyday. The way I play is largely dependent on which game it is. Zelda and Mario are primarily played docked. While Shovel Knight and Axiom Verge are played split but primarily in handheld mode. I guess you could say triple a games I play primarily in docked mode. I'm probably not alone in using docked mode more for games like BoTW and Odyssey but using handheld mode more for something like Golf Story. I think I use docked mode more often though. I feel like this poll is a bit shaky though since it doesn't say which mode people use more among those who use both modes frequently. Mine hasn't left the dock in months. I prefer docked mode however above all I prefer actually being able to play. With the wife hogging the TV this means that means that to get some gaming time I have to play handheld which I end up doing for 70-80% of the time. the concept really seems to work ! Docked mode is the primary mode. Handheld when the TV is being used by the family. I appreciate you can connect to WiFi hotspots but they are very limited here on Isle of Man. @LeonBelmontX As this dude just stated, I find the handeld mode highly convenient, but if I have the option to play docked then I do so. I've only used tabletop mode once as I have no real reason to play it like that. I use the switch as a switch. Whichever playstyle suites me based upon my location. I go both ways with the switch (snicker), But depending on what I'm doing in-game I play one mode more than the other. Ex. for collecting, organizing or any task I can play and watch tv at the same time, portable. For actions that requires more undivided attention like a battle, docked. So for FE Warriors, I'll battle on the big screen and for timely work with the camp, portable. I find it really uncomfortable to play switch in handheld mode. It's too wide or something for me to able to hold it at a comfortable viewing distance (like the 3ds) so I end up holding it lower and hunching over it. I think it's because I'm old. I use both modes, depending on the game and other circumstances. All-in-all I definitely favor the portable mode, even if I am at home, so I can e.g. use the TV to watch Stranger Things while I work my way through FE Warriors I actually rarely use my Switch on-the-go, such as it is. I never once used the Tabletop mode though, I mean, when I purchased the device, I tried it out obviously, but that was about it. Never actually played anything that way. The screen is just to tiny for my taste. It's good that it exist, but other than the rarest of rare occasions where I am using it on the go, and I want to play multiplayer, it'll never be used in the future neither. Still, as a portable the Switch is amazing, and I love that I can hock it up to the TV to enjoy e.g. Zelda on a big screen, should I feel like it. until Mario came out it was always undocked. Handheld mode is better, less aliasing than TV. Play docked mode for whole day gaming session, handheld mode for short gaming session, unless you get those external batteries pack. I can’t really say. I’m really inconsistent and it varies by game. For example, I play NBA in portable mode more but Odyssey more in docked. I only play in handheld mode. I have never and will never connect it to a TV. I bought this with the sole intention of always playing in handheld mode too. Seems grossly overpriced (at $300) for a handheld system too, considering that the screen isn’t THAT much bigger than the 3ds XL, but since I paid less than $250 for my Switch (huge sale), I guess it’s alright. Handheld all the way with a Mumba Heavy Duty case. I would say it’s 60/40 handheld, but I’m not sure that’s preferred. I have college classes and work, so I’m out of the house a lot. That was the initial reason I wanted a Switch. When I’m home I opt for tv, unless my girlfriend is watching something I don’t like(which is most of the time, I don’t like most tv on the big networks). As an aside, I’m loving Mario, but it was obviously not intended for handheld use optimally. I’ll have to find a new game to play at school, Doom hurry up! I've only ever played in handheld mode. Off topic: This website is no longer displaying a mobile-friendly version on my phone. Is there a way to change it back? I get the feeling these figures may change once Odyssey has been out for a while... seeing as it's designed primarily around playing with the joy-cons detached, this will almost certainly see more people playing docked. The Switch is pretty much the most uncomfortable handheld ever though. I've played mostly handheld due to the left joy con issue. However, I am use to playing BoTW in handheld mode because of it while I much rather play Splatoon 2 and Mario docked. I wouldn't say I prefer it per se, but I do play handheld a lot more just because it's so convenient and works so well. I can play during TV ad breaks, while putting kids to sleep, when on boring family visits, etc. I thought the same thing after spending so many comfortable hours with the WiiU Gamepad... I figured someone would come up with something to make the Switch more like the Gamepad, and they did... I bought a rubbery "case" for the Switch for about $10 on Amazon that adds palm swells to the back, while staying completely out of the way of the control sticks and buttons. It is WAY more comfortable now and still fits in my travel case while attached... you will, of course, need to remove it in order to dock the Switch... but future dock designs could help with that. If interested, just search Amazon for "YCCTEAM Switch Case"... I actually bought the one made by JETech since it is all black, but the YCCTEAM appears to be the same thing for $9. I know my friend prefers his Switch as a docked console pretty absolutely - even though I don't yet have a Switch, I'm sure though that I'll be using it as a handheld almost exclusively. I've always liked handhelds more than consoles, specifically Nintendo handhelds. Like, I've always enjoyed console and pc gaming, but without a doubt Ninty Handhelds (GBA - DS - 3DS) have been the cherished core of my gaming experience. Plus it's just more convenient with only so many TVs in the house. The pro controller is my favorite controller ever, and I almost never use in undocked, so docked is my favorite. I also really like that my smart TV increases the framerate on games like Breath of the Wild, Snake Pass, and Mario plus Rabbids kingdom battle up to 60 fps. So my TV's framerate boosting power really makes me only want to play games in portable mode if they run at 60 fps undocked. Zelda looks way worse in portable mode just because of the halving of the framerate. A television set's display screen is communal and is therefore usually shared, whereas with portable gaming, this doesn't need to be the case. Also, portable game systems usually have their own display screens, and therefore things like compatibility and ideal resolution are not a concern. I don't even know where my dock is right now. Have only played in handheld mode. Will eventually try out the dock, I am sure, but already have XBone and PS4 hooked up to the TV, so not feeling a need to hook up the Switch now when it plays so well in-hand. I play pretty equally between docked and portable. It mostly depends on how charged the Switch is, if the tv is being used, and how/where I want to sit. @Ralizah Agreed. I don't like the click-baity headline titles this site employs sometimes. Using both modes is clearly the preferred option here, with mostly handheld being 2nd and mostly docked 3rd. When at home it's almost always docked but I take it with me when I travel. Having it both ways is what I've always wanted in a console! I primarily play in docked mode. It hasn't left my house yet and I doubt it will. I hope this helps kill any idea of a 3DS successor and just have the Switch handle both the home console and portable markets. One system for developers to work with, even if it means no more touch screen convenience for future Pokemon and Ace Attorney games besides what's coming next month. Considering how my free time is nowadays, I play pretty much any way I can lol. I think me playing on the dock at home gets a slight edge as I play for longer sessions there, and only when I need to give up the TV do I switch off to portable mode while at home, which is usually only for several minutes to a couple hours. At work, I rarely get to play it more than a couple minutes at a time. In our household it gets played in handheld mode if someone else is using the TV (usually for the PS4), and in docked mode if the TV is free. Docked 90% of the time. I'd take it everywhere though if my 3DS wasn't still my primary portable. I use it almost exclusively in handheld mode. I don't think my launch day Switch has seen the inside of its dock to this day. Though the pita motion controls for Mario Odyssey are at least tempting me to play that one tabletop from time to time, a mode I have used a couple of times before. The fact that most people fall into the "both modes" category is great, because it means that Nintendo has A) conceived a solid idea and then thoroughly developed it into a complete product, unlike Wii U which was clearly half baked, and B) adequately informed people about that core concept and made them care about it enough to buy the thing. So, pretty much the opposite of Wii U (to be fair, I love my Wii U, but still). I mostly use mine docked, but I play it in bed and at work often enough that I'd have said both handheld and docked. I prefer to use the Pro Controller and play docked, but also quite enjoy taking it with me for my daily commute on the subway, so end up playing a good deal in portable also. I'm about 60/40 docked. Mostly docked on the weekend and porch/bed portable during the week. I prefer mine docked. I've always preferred to play games on the TV rather than craning my neck playing with a glorified brick, and I very seldom play undocked or handheld. TVs can't boost a systems native frame rate. Are you using motion interpolation? I always find it adds way too much input lag. It is built on tablet hardware. It is perceived by developers as a handheld (mobile developers just see it as another mobile platform, while traditional game developers name its portability as the main appeal). And the Switch owners themselves use it primarily as a handheld. People can argue against it all they want, but the fact is that the Switch is just a handheld and nothing more. Yes, it has HDMI-out, but so do almost all mobiles and tablets nowadays. Just because you can connect a tablet to a TV (and the producer of the tablet calls it a 'hybrid'), doesn't make it a PC. It's a real shame that Nintendo abandoned the home console market just like that. And now they're stuck in the handheld market (where they're #1 due to lack of competition). When I get my Switch, it'll likely mostly be docked with a bit of handheld play now and again. That will depend on my job situation at the time though. I don't understand the debate. It's a portable console. A console that is portable. It certainly 'feels' like a portable, even though I always use it docked like a console. It is whatever you want it to be. Or maybe, it is both. The user data shows that it's both, at least. My battery only seems to last about two hours, think its screwed. I've never used it handheld mode, but then I'm an old man who doesn't play games when walking the dog, or inbetween cooking dinner. Got a big screen TV, might as well make use of it. Its 75% docked for me and 25% handheld. I do love the fact that I can play on my bed, on the couch while my wife watches TV or plays another system and I can bring it to BBQs and have some quick games with the joy cons. The flexibility of the Switch set up is truly dynamic. Its unreal where and how you can play. That is the Switches killer app, its form function. Good games help too! @holygeez03 Thanks for the tip. Selling the Switch without the dock would be a HUGE mistake. I never dock my Switch. I might do it if I’m going to play with a friend someday, but that doesn’t really happen often at all... Mainly because I have few friends and most of them don’t like gaming. The problem with docking the Switch is that when you dock it, it’s stuck to the TV. That’s a bad thing. I already have a PlayStation 4 pro that’s stuck to the TV, that’s why I never use it. I like it both ways but I'm buying a portable dock so whenever there is a TV available then I can dock it. I wouldn't think to make a bundle without the dock would even be considered a budget option, the dock probably costs next to nothing to make. That thing looks/feels so cheap. I play it at home, because I have huge trust issues and I don’t trust that no one is going to steal and/or break it. It's fun to use it as a handheld, but depending on the game the screen can feel too small. Normally I use it in docked mode. I do bring it to my college since I have a ton of down time in between classes and my job on the campus, but as some have said...trust issues. Especially since I live in a bad/ghetto neighborhood. Fortunately...nobody's bothered me about it so far. Think they're more concerned about getting a new album or a gucci belt or jordans or something else not pertaining to games. 30% is not more than 70%, hype click bait. Depends on game for me, but that is still just a preference and not a must way to play. Am a fiddy fiddy playah. Much larger percent use it primarily in both modes tho. @MegaVel91 But it's far more sensationalist to ignite the "camp handheld" and "camp home-console" fire, as if having a "hybrid" isn't confusing enough. The whole merging of divisions and basically being guaranteed that Nintendo keeps the Switch as their path going forward saddens me, as it also means the compromises will remain. Guess I'll need a good coffee everytime a developer starts complaining about the hardware, otherwise I'll be so tired of hearing it I may as well go into hibernation. About 80% handheld. I plug the Dock in to the TV when needed... Mostly used as a charging stand. This is the worst article I have seen on NLife. It s misleading, wrong and sends the wrong signals out. The MAJORITY use both modes. That is, Nintendo's console is being used as intended. This article claims it's mostly used as a hand held. I would honestly delete. (My first actual moan at an article on this website!) - Oh, and please quit wondering about dockless, fixed joy con switches. The more folk think down this path...the less Switch it becomes (as well as cluttering / confusing it's brand which has been so cleanly presented). I hope new models have better battery, maybe an XL model and a extra horsepower. Yeah I don't usually complain but this is a really poor article. The numbers have been interpreted wrongly, possibly deliberately. Very disappointing. I primarily use it in docked mode. Playing games on a big TV can't be beaten. i have a questions one is portable mode including using it as a tabletop? i use mine depending on the game, mariokart i totally play portable more, splatoon and nba2k18 i have to play docked. Zelda i was mixed and so far i prefer mario as a portable. @shani: Of course, it is a portable console. Everybody knows that. However, there is not just an HDMI output but a whole functional concept included. By putting it in the dock and using the detached joycons, it works like a home console. The numbers above show us that this hybrid concept accepted. There, I don't see your point. Nevertheless, you are right by saying that Nintendo left the traditional home console market. They also did this with the Wii. Just because people play the Switch at home, doesn't mean it's docked all the time. I play my Switch mostly undocked at home, because it's more convenient for me. The 3ds also gets the most playing time, while I am home. Mostly docked, when available. Spla2oon I find almost unplayable in handheld mode. Odyssey I played through the whole story docked. I do play a lot of Tetris in handheld mode though. Tabletop is junk. The important take away here is not that more people prefer this mode or that, it's that you can play however you want, whenever you want. Oh, man. Stop being so narrow sighted. The stats show that most people use the Switch as intended. As a true hybrid console. And a big chunk of 20% uses it as a home console only. Actually it didn't offer any different modes... Just regular TV-out. lol - its terrible as a handheld if you have the option to dock it. I play mostly (98% of time) in handheld mode. Like the majority of users I use the switch in both modes, when I have some spare time at work I use portable mode, at home most of the time its docked, portable only when I go to bed. 98% Docked because I try to record gameplay whenever I'm playing at home. I usually don't take it to work, but when I do, that's the 2%. Well, when my hands get tired and/or my battery is almost dead, I dock it and continue my play. That's the amazing stuff from Switch. That considered, maybe this poll is... well... pointless. @electrolite77 Yes, I've never heard it called motion interpolation, but that sounds accurate. Yeah, if boogerboogerbooger-wheeerrrrp up racing games, but it works on Breath of the Wild. It seems to differ from game to game. I tried Ratchet and Clank on PS4, which looks horrible at 30fps, and it makes it run perfectly(appearing to be 60 fps), but totally screws up the timing of jumps. I guess if there was a lot of precise jumping in Zelda then it wouldn't work. I am Setsuna works great on Switch, and looks 60fps via my TV. I wish every game had a way I could select to lower the resolution or whatever was necessary to get a smooth responsive 60fps. Yeah I don't understand why Console games don't give us the choice. Its why I'm actually thinking of ditching my (non-Switch) consoles after this gen and going PC. I'm not sure I'll go for frame rate every time. It depends on the game. I'd like to have the choice though. I prefer docked because I have large, manly hands that cramp up using the little joy cons. I’m very manly. @electrolite77 Yeah, I have a PC for gaming and I love being able to adjust settings until I get a smooth framerate. Plus, the vast majority of games don't even need fiddled with, they just run at 60 fps from the get go. @dres I DID say "or at least out of my sight." So yeah, maybe they play it undocked in their homes, but the point I'm getting at is that while I used to see a ton of people playing games on devices that aren't smart phones (though, yes, of course, I see a lot of people playing games on those, too) on the train, even though Switch seems like a perfect device for that sort of thing, I still haven't seen it on the train.